In 2015 I started a PhD in Computer Science at The University of Nottingham. 📚 From this point, I became heavily involved in lots of “Tech” flavoured things; including student hackathons, workshops, meet ups, conferences and more. 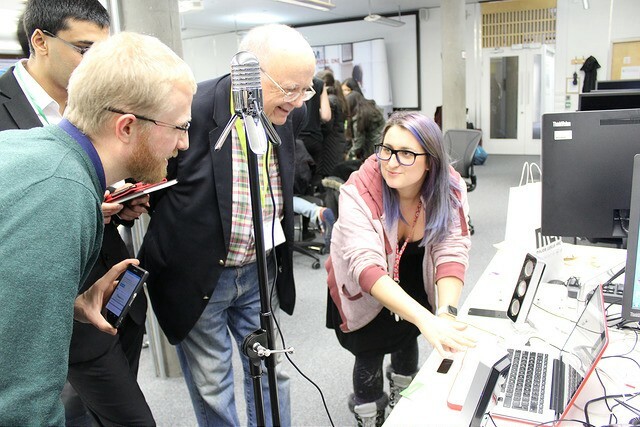 This is me (right) presenting my first hack to three judges at the science fair for HackNotts 2015. As my passion for breaking and making things grew, so did my feelings towards advocating for more non-male role models in Tech. In 2016 & 2017, I lead the organisation of a Women in Tech conference called InspireWiT. Since then I have continued to support this annual event and other inclusive events through My Kind Of Tech — a community focused company created by me and my friends. 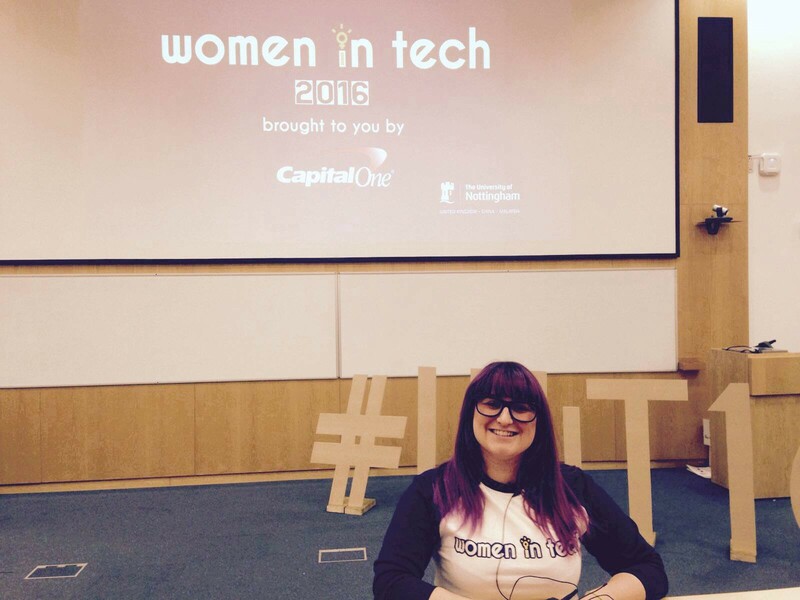 Here I am, standing at the front of the lecture space where we had the InspireWiT 2016 talks. In October 2016 I was accepted onto the GitHub Campus Experts program and since becoming a Campus Expert, I have taught Git workshops and given talks all over the world. Through this I also received training in community building, hosting accessible events and public speaking, amongst many other things. Me (second from the left) with some of the other Campus Experts and our program leader Joe Nash (who we are holding up in the middle) at HackCon EU 2017. Whilst doing some Campus Expert flavoured things, I had the pleasure of meeting Jo Franchetti on several occasions. We followed each other on social media and I began seeing the awesome work that Jo did at Samsung. Following this, in February this year I met Daniel Appelquist at the Global Diversity CFP day and I was blown away to see how much the team cared about the issue of diversity within the tech industry. When I saw that there was an opportunity to work with this awesome team of people, that really care about the work they do and the impact that they have on the community — I jumped at the chance to apply and I got the job! I’m an A11y advocate (if you haven’t heard this term before — we use a11y to say accessibility because there are 11 letters between the a & y). My PhD research focuses on accessibility in Digital Musical Instruments (DMIs) and I’m a huge supporter of making the web a more accessible place. This is a topic that links in closely with the team’s goal to ‘leave the web better than we found it’. As far as web standards go, accessibility is definitely getting more focus recently. Despite this, many web tools are developed with no regard for accessibility whatsoever. Sometimes this is questioned and accessibility becomes a feature (or series of features) added onto a project later — but this still leads to challenging work-arounds and some interesting user experiences. Accessibility standards are particularly absent when you get to the Progressive Web Apps (PWA) territory. These kinds of applications often negate built in accessibility features and have some interactions that assume the user’s ability and knowledge. In my time here I hope to explore this a little bit more and highlight the challenges for accessibility when building a PWA. This will include helping developers observe best practices and test their PWAs for accessibility. As I’m interning with the Web Developer Advocacy team — there is no time like the present to level up my skills in web development. I’ll be hacking on some web-audio hacks (featuring hardware) in the next few weeks at events like Electromagnetic Field and Music Tech Fest. Expect to see something from me soon about these events. Again this links with one of the the team goals which is ‘to lead by example by being good citizens of the web developer community’. Open source is a huge part of the web developer community and as a GitHub Campus Expert this is where I have quite a bit of experience. Especially when it comes to version control with Git and best practices for open source projects. I’ll be spending some of my time here helping the team with these kinds of things. 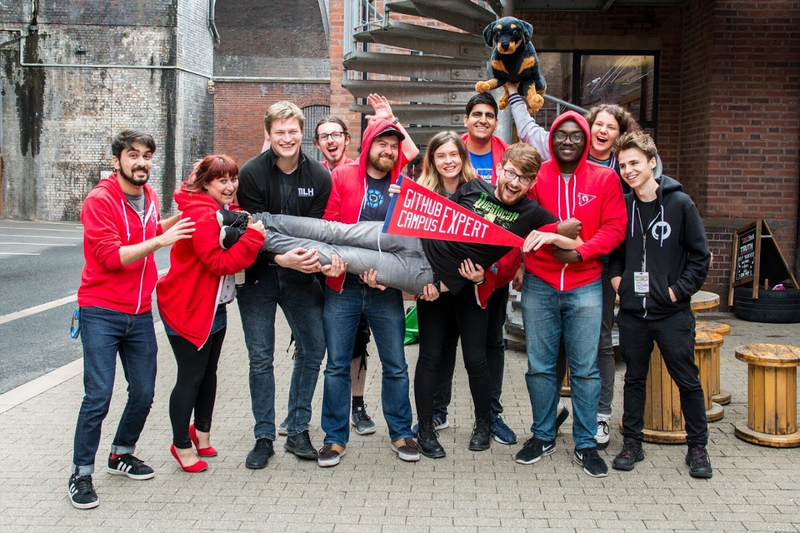 Including what we can do to help with community initiatives like Hacktoberfest, 24 pull requests and supporting the wider open source community. If you have any questions or want to chat about anything you can find me on Twitter or Mastodon. By Amy Dickens on August 31, 2018.